Friday 18th March, various venuesLight Night: the annual evening so jam packed with fun that planning is an almost impossible challenge. Which, of all the 100+ events of which many sound equally interesting, are the most worthy of prioritising? One constant is that I’ve always tried to do is catch the commissions – the equivalent of festival headliners. 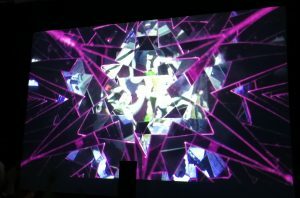 And because this is a visual arts blog I have focused, in the 3 years since I’ve been writing about my Light Night experiences, tried to focus on the visual works. But I burned out on audio-visual installations this year. Light Night has always included a few of these: this year I visited four, and could have gone for a fifth if I wasn’t so in need of finding something different. The problem with having so many is that they’re not all going to be as good as each other. Take the first two stops I made on the Waterfront, the Singing Mirror at the British Music Experience and Diffringere at RIBA North. Diffringere was billed as a recreation of the Northern Lights indoors, and it did not disappoint. My photos make it look like simple lasers, but in reality the effect was strikingly beautiful . Singing Mirror, on the other hand, was not. I was just pretty underwhlemed, if I’m honest – the effect of the audience on its appearance wasn’t interesting or revolutionary enough to engage me. The kids in the audience seemed to enjoy it though. Over in the Baltic Triangle another two installations waited, with similarly dividing responses. I did enjoy Elizabeth Challinor’s Fleeting (featured image) on Jordan Street. It was certainly an intense experience, walking into a pitch-black room in which flashes of UV revealed messages on the wall. But it was a good kind of intense which, like Diffringere, genuinely deserved the description ‘immersive’. Unlike Carlos Bernal’s Anamorphix over at Hinterlands – a venue visited by chance following a brief stop at The Royal Standard. Bernal has shown pieces at the last two Light Night’s and I did enjoy the combinations of visuals on this one, but it didn’t wow me or feel as different as Fleeting had. And in the age of VR, sitting in front of a screen doesn’t get to be described as “immersive” anymore. If I’m sounding negative, though, I still had a really fun evening. I love the almost festival-like atmosphere Light Night brings to the city, especially on as beautiful an evening as this year’s was. Even if you don’t really stop, there’s plenty to discover walking between places, and one of my highlights of the evening was discovered by chance in this was. 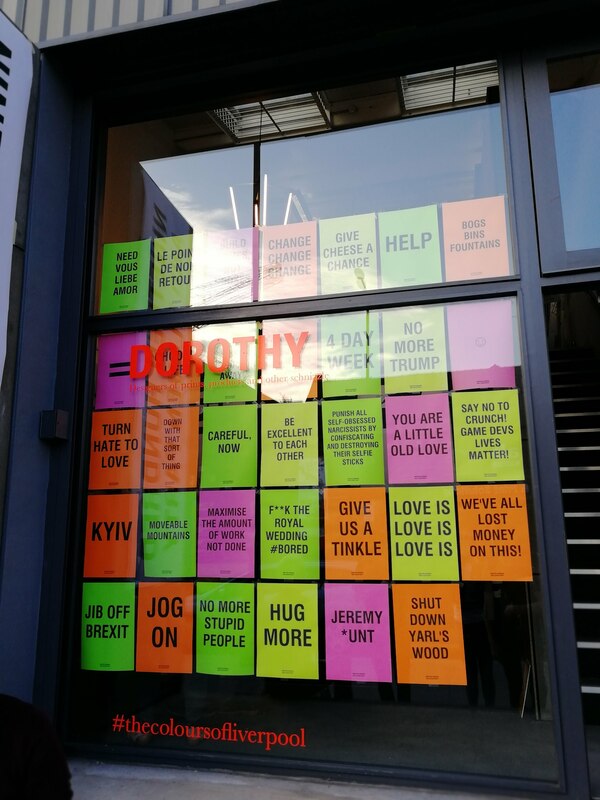 For if visual creations are one integral part of Light Night, the other is the opening up of spaces to participation, such as Dorothy on Jamaica Street was. 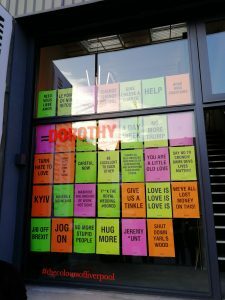 Intrigued by the neon window display , the studio were letting all comers have a go at printing their own text poster. Everyone there was welcoming, and all sorts of people were stopping by for a go. This is what Light Night is about – making places feel special. And while special commissions are of course a good idea, trying to get to so many means I missed out on other things which sounded like known spaces making real efforts. Maybe next year I’ll change tack and focus on visiting these. The enthusiasm of the staff on the heritage buses, some quite amazing bus-based chat was overheard. Also cheers to Dorothy (of the poster above) for the free beer! This entry was posted in Exhibitions, Home, Past exhibitions and tagged art, culture, Light Night, Liverpool. Bookmark the permalink.